After a fabulous first day, we were anxious for the start of day 2. Joseph, our guide asked us what our target would be for the day. Casually, we said “Cheetahs”. Without flinching, Joseph said lets go find them! Less than 400 yards from the lodge, Joseph who leans out of the Landcruiser as he drives, spots some interesting tracks on the dusty road. Immediately, he gives a big smile and says that these are Cheetah tracks and there are two of them. By now our hearts are responding to the building adrenaline rush, and we take out the binoculars and scan the horizon. Seeing nothing we proceed on to the next rise where we again inspect for tracks and scan the horizon. No cats in sight but Joseph says “no worries”. 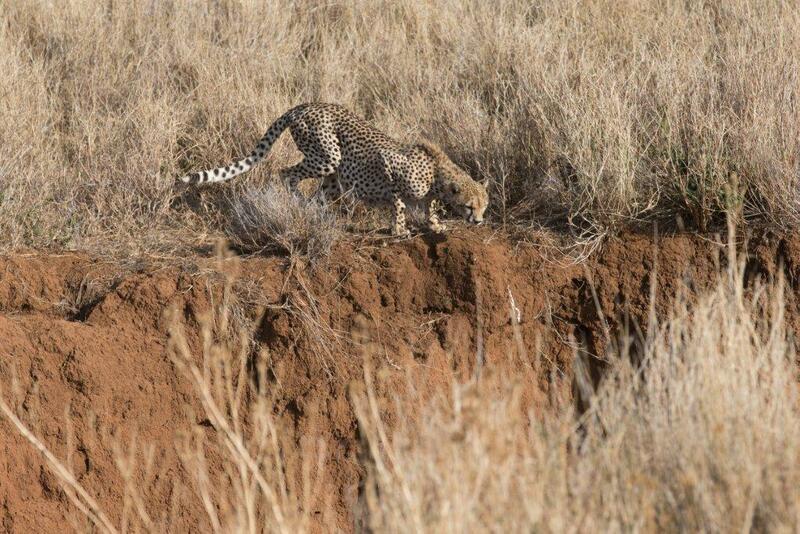 We continue this process for a few miles checking at every ridge for signs of the pair of cheetahs. No luck…yet! Shortly we come to a T in the road, and we turn left while all the time looking and confirming that we were still seeing the tracks. Moments later, Joseph exclaims “cheetah in the tree, cheetah in the tree!”. Marian and I hurriedly point our cameras in the direction of a small shrub at the edge of the field…but it was empty. Disappointment floods us until suddenly we see movement of not one but two female Cheetahs forever known to us as the “twin girls”. We pull of road and head out into the tall grass trying to anticipate the path of the “twins”. Soon we see a head and then a second pop up. Clearly we have drawn a bead on the cheetahs due to Josephs expertise. Now we are getting some photographs as they move through the tall grass. All is good until we see a ravine that the Landcruiser has no possibility of negotiating. Our jaws drop as we know our only alternative is to go back to the main road and cross the bridge. The time necessary likely meant we would never see the “twins” again. But there is movement on the edge of the ravine. 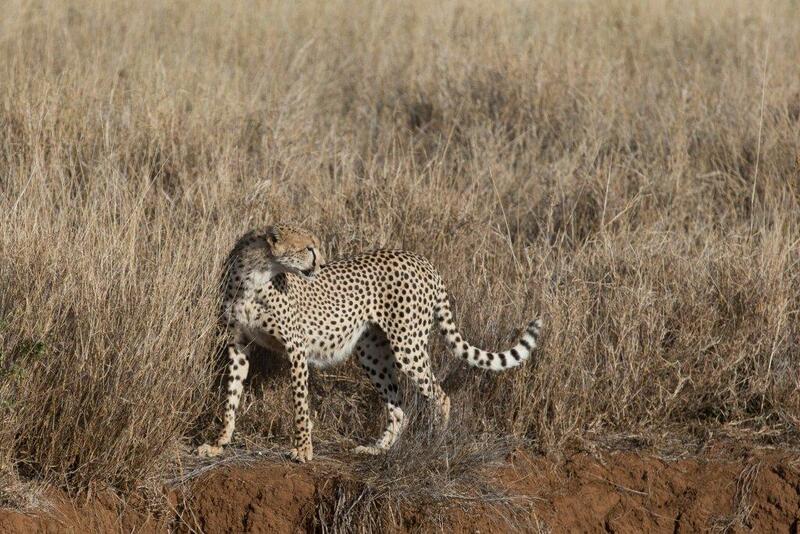 Suddenly cheetah #1 pops her head, the #2 pops her head so all is not lost. Expertly Joseph maneuvers the vehicle so we can see the cats and capture the best light. We watch how they position themselves to leap on any unsuspecting prey that comes down the ravine. It is clear to us that the “twins” have run this play before! But today was a day that the “prey” did not run down the ravine and the cats soon cross the ravine. Disheartened we run to the main road, cross the bridge and go back off road. Except this time it is on the other side. First sign that were back on their trial is the spooking of a covey of guineas. Then an ostrich takes off running away from our direction. 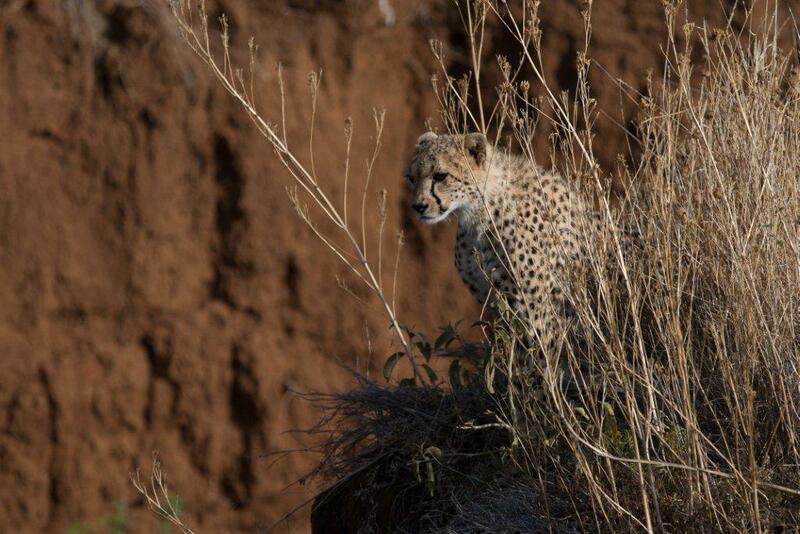 We clearly were back on the cheetahs and we watched them move through the tall grass. But as suddenly as they appeared, they disappear again. While Marian and I feel our frustration, Joesph again reassures us “no worries”. 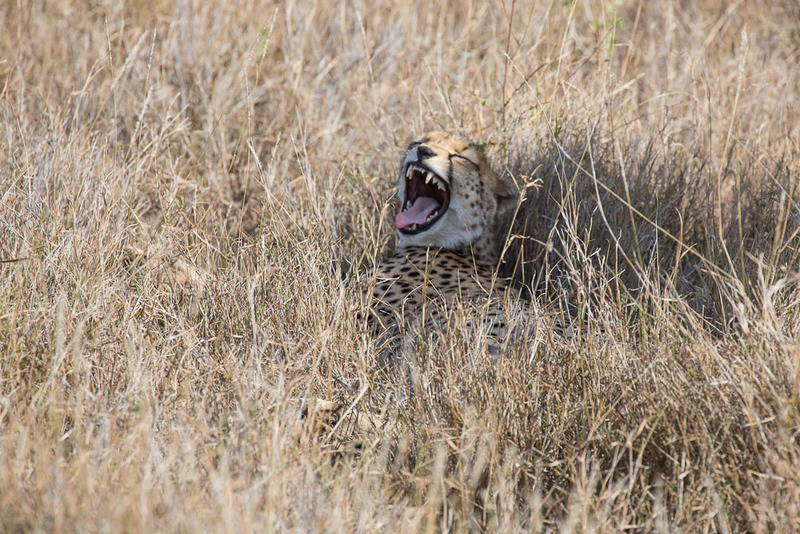 He surmises that we will find the cheetahs again but likely in the shade of a small bush as he explains how cheetahs rest. We run by bush after bush with no luck until Joseph uses hand signals and points down toward the grass next to a 3′ shrub. We look in the direction he is pointing and see nothing but grass. Joseph smiled and points again at the tall grass around the shrub tree-but this time he was more forceful…Marian and I no doubt looked confused as we were no more than two feet from the shrub and we saw no cheetahs. Finally, Joseph moves the vehicle around to the other side of the tree and there they were. Two beautiful Cheetah gals! How can they hide so well in plain sight? Now we are taking the sleepy cheetahs picture but soon realize that the cheetahs are going to sleep for a while. So we head back to lunch. On the way back Joseph asks us what we would like to shoot in the afternoon and we responded again with big cats. Joseph smiles and says no worries, we will go find the big male tigers this afternoon and we are sure he will. Later when we venture out, we pass some white rhinoceros that are being rather aggressive to one another. We could not resist so we pull up to see exactly what was going on. By now we could see a big ugly male that clearly had things on his mind that involved the two females…..who clearly had no interest in him whatsoever. After watching them snort and scratch for about 10 minutes, we prepare to leave to go find the lions. Suddenly, there is a stir..and an aggressive snort at that . Next thing we know nearly 4000 pounds of rhino is headed right toward our truck…at a high rate of speed. Dust is flying, the rhinos are grunting and we are bracing for a terrific collision. But the expected collision did not happen. 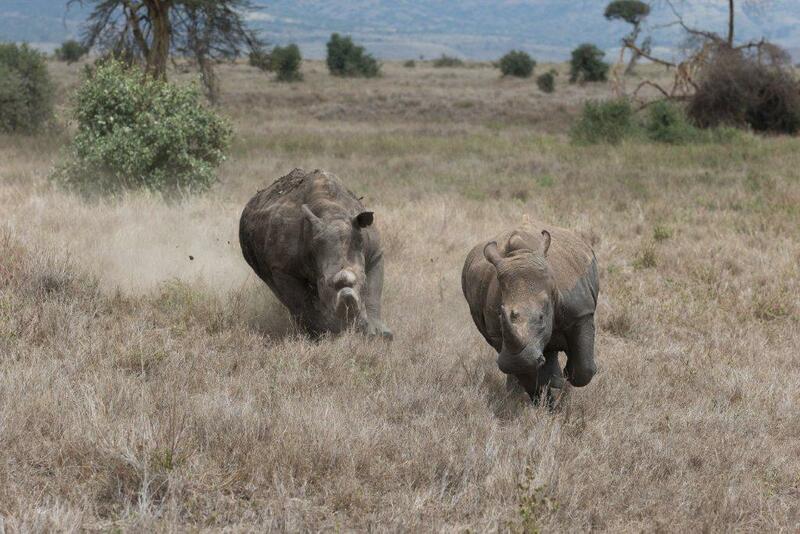 The young female rhino veered off and the ugly black rhino went with her. Exhausted we head back to camp for lunch, knowing that looking for big male lions is next on our agenda. At 4pm, we load our gear and head looking for some male lions. 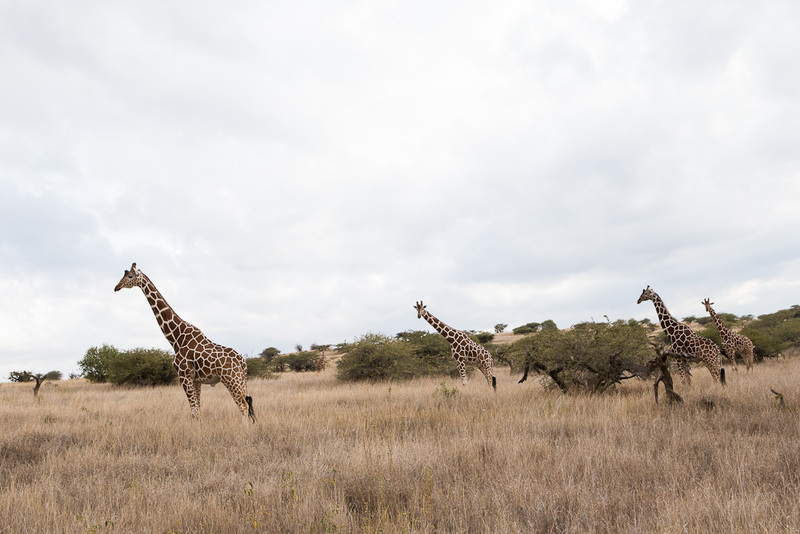 First we decide to go looking around for different species of antelope and more. Then we needed to move on and look for signs of male lions. 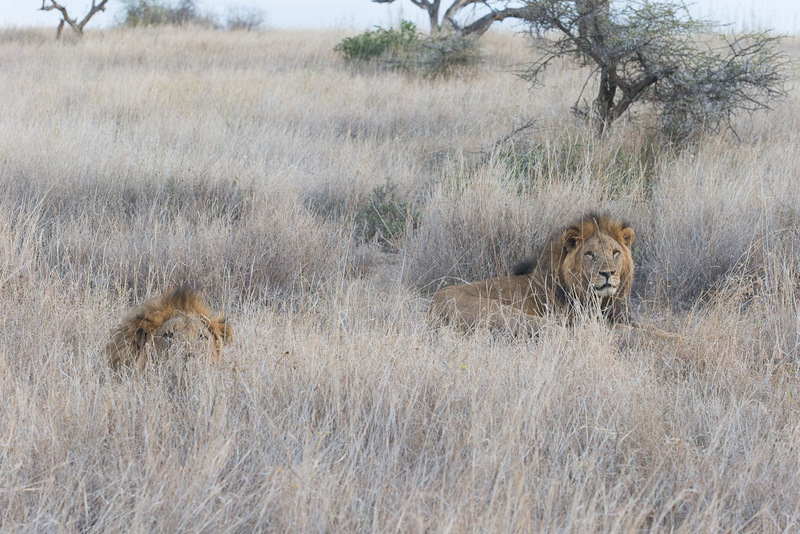 We knew that we likely would not see male lions on the prowl. Rather it was more likely that the males would be sleeping somewhere not far from the females. We know that the king of the beast is actually quite lazy, does little hunting and sleeps as much as 20 hours a day. Joseph looks for tracks as we drive about and soon he finds the tracks of two lions that he believes are male. We then ask Joseph how we will locate them since we had already seen cheetahs become nearly invisible under a small shrub while the slept. He informed us of some keys to watch far. Bird activity, scattering wildlife but often he said the main thing was to watch keys from the animals that have the best view of the savannah the giraffe. He explained further that they likely would become somewhat stationary and would have their gaze fixed in the same direction. So we decide to move on to a lush ravine with a plan to come back just before dark. 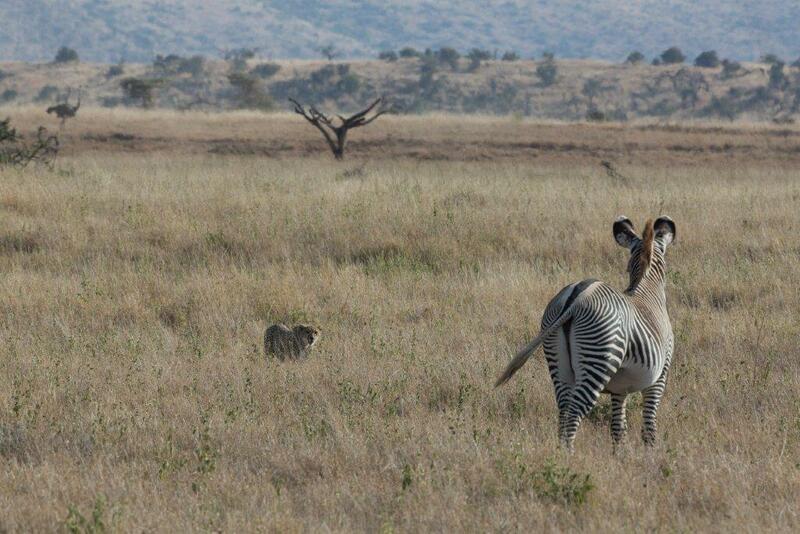 Surprisingly, we find the lushes area we had seen in Lewa yet. So lush that there actually were palm trees. Here we found cape buffalo, an enormous rhino, eagles and more. Feeling fully satisfied with another great day, we head back to the lions for one more viewing of the lazy brothers. Good news they had moved, but only about 3′ to take advantage of the changing shade. Again we snapped a few images and then headed home for a sundowner-knowing soon we will try to sleep with difficulty due to the anticipation of Day 3. Phenomenal, Steve. I am so happy for you and Marian. What a wonderful experience! Wonderful to see latest pictures. Ernest Thompson of Greensboro father of Mary Helen Uffman. We love reading the stories and seeing all the picture!!! How amazing to be able to see in real life what most of us only see on TV or the Zoo!! Kim @ White Oak Animal Hospital!